In my last post, we took a look at the best lead generation sources for real estate agents (special thanks to the National Association of Realtors for its fantastic research on the topic). Why is keeping up on lead generation so important? You already know the answer: Because marketplace shifts continue to make for a more complex business environment. It takes time and effort to cut through the clutter. You probably wish they did. It’d be a lot easier if they did. But they don’t. 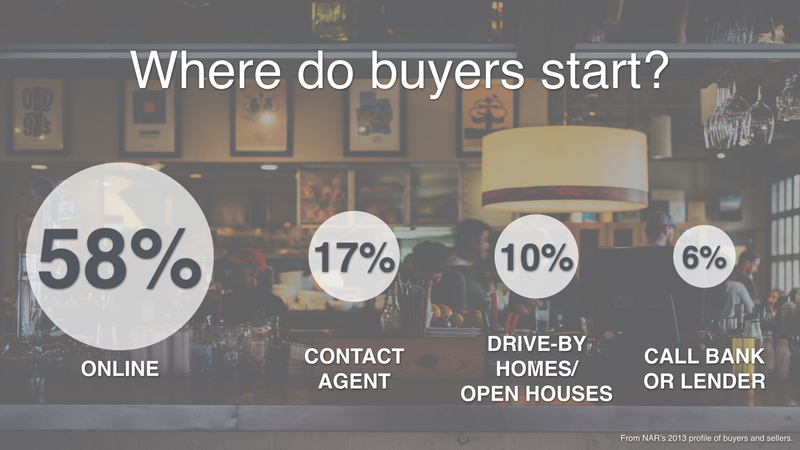 Where buyers start their process. A majority start online by searching for homes using online search portals or by looking up information on the buying process. Others will get in the car and begin looking at homes in person. And some will contact a bank or lender to get their financial situation squared away. The main point here is that 83 percent of buyers will not contact you first. I apologize in advance. This only gets worse. No surprise here. The industry is full of real estate agents competing for attention — and it’s a terribly noisy world. Imagine your buyers heading online, driving by homes or calling banks and lenders. What will they encounter? They’ll be referred to your competitors. They’ll meet other agents in person at open houses. And that’s just a small sampling of what they might encounter. But maybe you don’t have to worry. Maybe they’ll still come back around and contact you. Buying a home is a critical decision. Surely they’ll seek out an ideal real estate agent and weed out any unsavory characters, including your competitors, right? You would think that buyers would go through a rigorous vetting process to find a truly great agent. Unfortunately, that doesn’t seem to be the case. 67% of buyers interview only one agent. Buyers are going to find an agent they think will work, and then they’ll probably choose that agent without talking to any others. Because potential clients don’t start with you, they’re likely to run into your competitors and potentially choose them. And they’ll do it without you even knowing. That’s why lead generation is so vital. And lead generation is not just for people you’ve never met. You need to use lead generation and marketing techniques with your contacts. In fact, that’s your best lead source, but you already knew that if you watched our last video. How can you get better at lead generation? Start investing in new technology. Know who’s more likely to sell a home, buy a home and refer you to others. Track data. Monitor their activity and behavior. And, most importantly, make sure your tech tools focus on building stronger relationships. Relationships, built on sophisticated sales and a marketing platform, make for a healthier sales pipeline. What do you think? Do you see more of your contacts slipping away? What are you doing to prevent that from happening? Please share your thoughts in the comments section below. Jay Sherer is the co-founder of Hello Agent, which predicts those most likely to sell a home, buy a home and refer you to others. Follow him (@JaySherer) or Hello Agent (@HelloAgentPro) on Twitter.